This tattoo set is HUGE. There are 4 large pieces for the front torso, 4 for the back, and 2 upper and 2 lower arms. Back of neck, upper shoulder, and face pieces make for 17 pieces all together. It is as character accurate as I could draw it while keeping the application process as straightforward as possible. This tattoo set takes ages to apply (and even longer for me to print and prepare! ), but it looks amazing. Once applied, each torso set measures approximately 20" high and 16" wide. Each arm piece is approximately 10.5" high. I cannot make the dimensions any bigger without doubling the price, as I've maxed out my printing area on each sheet. However, even if you're significantly larger than I am, the tattoos will simply be spaced wider apart and overall effect will be quite impressive. If the tattoo is too big for you, it can be cut down to size once it arrives. Turnaround takes me 5 business days before shipping. Domestic shipping takes an additional 1-5 business days, depending on the method you select. Seventh Skin tattoos are made to LAST once put on the skin, so removal of such large pieces can be difficult. Be gentle with your skin, and follow the directions carefully during application and removal. Leave plenty of time (30 min or more) for both. The longer you wear your tattoos, the easier they will be to remove. If cared for properly, this sleeve will last well for 2-4 full days of convention wear, and will then start to fade. Drax is a grey dude. 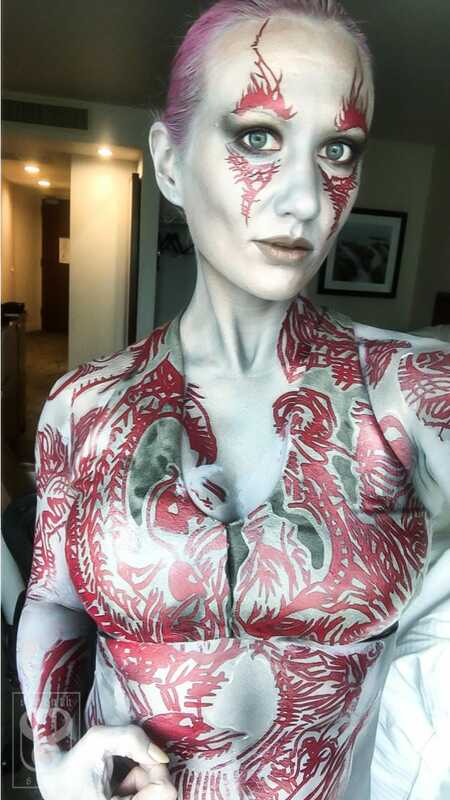 Assuming you'll be painted up like I was, a word of advice: use pigment and/or water cake makeup mixed with Mehron (or similar) mixing liquid. Do not use only water to mix. I ran out of mixing liquid partway through my paint job before the tattoos, and the tattoo transfers that were applied over the water based pigment started flaking and peeling right away. 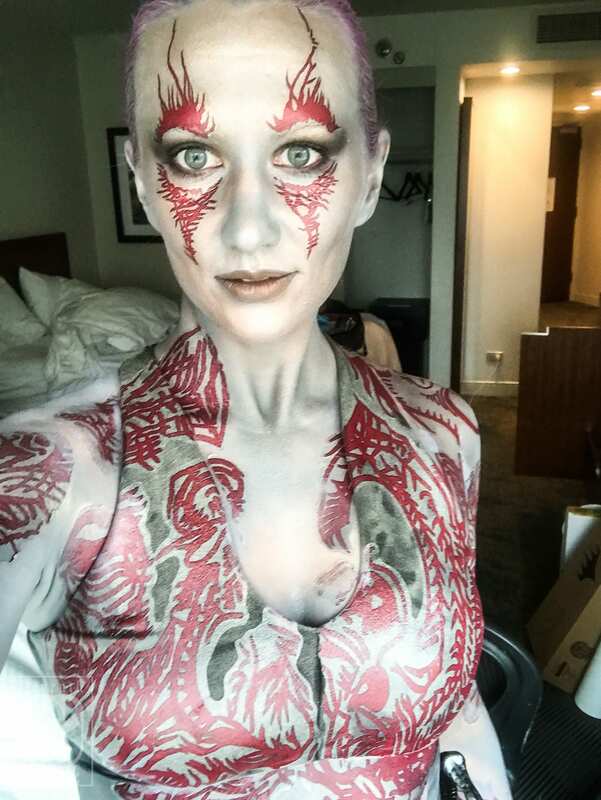 The mixing liquid-based makeup (any alcohol-based makeup should work just beautifully) was a much better foundation, and those tattoos performed excellently. 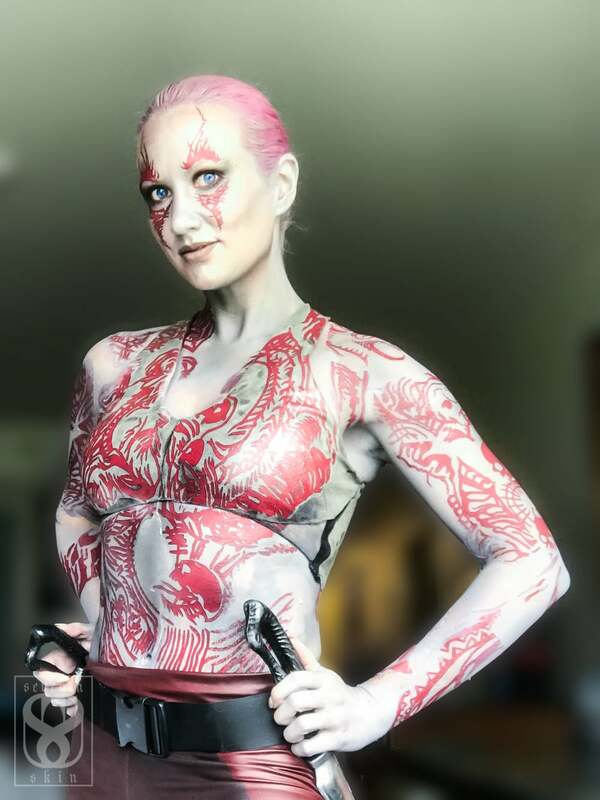 Since I was "Lady Drax," I had to wear some extra clothing. ;-) I applied the tattoo transfers directly over my polyester top, and they held up perfectly. I'll even be able to use the same top in the future for the same cosplay! You dudes will have a far easier time applying these than I did. As with all our large pieces, some cracking where your skin flexes is normal during wear. Wearing a light, long sleeved shirt when you sleep will help your tattoo last longer. When applying, have someone help you! Once the pieces are arranged on your arm and chest, start using the damp cloth on the seams first, and work your way outward. The very best lotion I've found for my tattoos is called Silk Hydration by Hawaiian Tropics. Have some translucent powder onhand, too. I may have drawn up the artwork myself, but the concept is (obviously) not my own. 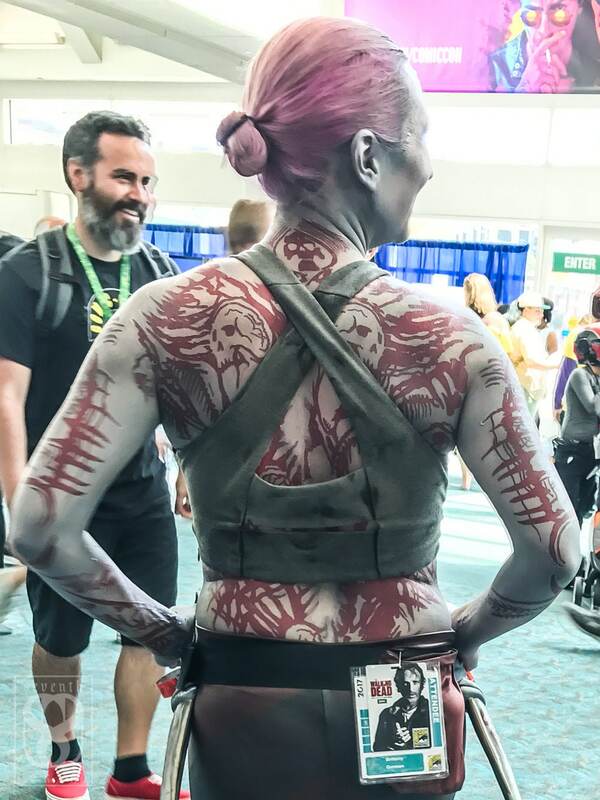 This character has become a celebrated cosplay staple, and I wanted to make a quality item available to you die-hard cosplay artists out there! Publicly released character details were used when creating this sleeve. A numbered application guide will be included with each order. Full instructions and tips are located in the FAQ.